Wildlife photographed on site at Carmen's church, New Life Lutheran. Luke 24:13Now on that same day two of them were going to a village called Emmaus, about seven miles from Jerusalem, 14and talking with each other about all these things that had happened. 15While they were talking and discussing, Jesus himself came near and went with them, 16but their eyes were kept from recognizing him. In the traditional cycles of readings of the Christian church, the Easter season is filled with stories of Jesus appearing to his friends and followers after his death. He appears in strange places, ways and times. They often do not recognize him; they are not sure if he is a ghost. Often, he eats with them, as if to demonstrate his realness, his physicality. In the famous story of the walk to Emmaus, two disciples, people the readers have never heard of before, walk seven miles from Jerusalem to a nearby town. After the crucifixion, they are sad and confused, feeling that their great cause, the backing of a messiah, has failed. A stranger joins them, and walks with them. They do not recognize the stranger as Jesus. They talk, he instructs, reassures. Still, they come to their destination tired, worried. The stranger makes as if to walk on, but they invite him in. At the dinner table, he takes bread, blesses it, breaks it, and gives it to them. In this act, they recognize Jesus. He vanishes from their site. This Easter season is one in which Christians have the opportunity to grapple with the incarnation, the physical in-breaking of the God of the universe into the earthy reality of life. The baby God being born of a human woman and coming naked into the world at Christmas time is a miraculous and beautiful story. A grown man coming back from the dead and touching, breathing on, and eating with his friends is less ethereal and charming somehow. Here our rational minds chafe and have trouble with the logistics of this story. A bobcat roams the church grounds. And yet, here is where God is so close, so connected with all the earth. Here God is human in regular ways: walking, eating. Here God is breathing air, eating food made from plants, drinking the same water that has existed here from the beginning of water on earth. This story is no more miraculous, and no less believable or more understandable to me than biology. The idea that the thin layer of soil, the skin of the earth, its crust, contains and sustains so much life is miraculous. The number of organisms in a handful of dirt boggles the mind. The way that scavengers, bugs, microbes, and fungi all work together to make dead things into building blocks for new living things - this is more than we can understand. It had to be real, the resurrection, for it to be, well, real. It had to be physical and earthy to go beyond abstract philosophy about bodies as shells, earth as filth, physicality as that which binds our pure, ethereal spirits. If God came as a human, then our bodies were also made holy. If God came as part of earth’s substance and a local ecosystem, then all creation is holy, and is redeemed from human destruction and disregard. 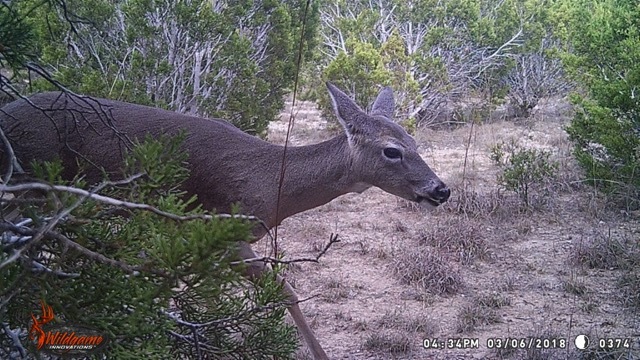 At New Life Lutheran in Dripping Springs, Texas, we are re-wilding a 12-acre piece of Texas Hill Country ranch land. Fences for sheep, goats and cattle limited the natural spread of wilderness and biodiversity. Texas Naturalist Roy Bedichek described the pre-Columbian, pre-fence landscape as one of ebb and flow of biological variety. An example was turkeys, who passed through an area, and only stayed if there was an outbreak of insects, for instance, that needed to be brought back into check, into balance. We forget that we are all connected and we forget that we cannot control nature. We can replant native plants, and we can reintroduce native bees and build houses for native birds, cleaning out the nests of invading sparrows and starlings. But we are really just creating space for nature to do miracles, to decompose dead things and make amino acids and spores and crazy cocoons for insects, and repopulate and fill up the earth with what it needs, and what we cannot see and cannot understand. We make space; remove not just invasive species, but, as Bedichek said, we try to remove monotony, to give room for nature’s creative process, in every sense of the word. Faith is like that. We are re-wilding our hearts and our minds, not deciding how to cultivate them in just the right way, to make them beautiful and productive, but letting them go wild, letting them imagine the unimaginable, the things we think of as impossible, so that we are made whole in ways we cannot understand completely, or even incompletely. The re-wilding story of Christianity is the story of life from death. It is a story of the short-circuiting of all that we understand of decomposition of bodies and fertilization of plants and photosynthesis and digestion and matter that was once living, becoming energy in the blood of mothers, flowing into babies in wombs, and bursting out into new life. That is miraculous enough. But what if that predictable natural process went in different directions, and a human man went into the earth and came out living, breathing, walking and eating? What if that wasn’t just biology going in a crazy direction, nature mutating to avoid monotony, but the earth itself trying to re-wild the human brain, to let us know that we don’t know, that we don’t have it figured out, that we have to let go of control and let ourselves be surprised so that nature can do its thing in us? So that new neurons could fire in our brains, previously too engrained in monotonous pathways, so that synapses could fire and breath be caught and hearts race, so that we could be new again, ourselves. Nature is not separate from God. We are not separate from nature. We are rewilded as we make space for Jesus to show up walking with us, breaking bread, at our communion table, on our hiking trails, and as we make space for native grasses and mason bees and live oak seedlings on the land that surrounds that table, and the soil on which it stands. Rev. 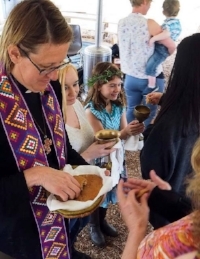 Carmen Retzlaff is pastor at New Life Lutheran Church in Dripping Springs, TX. -- an all outdoor congregation, and a member of the AllCreation mgmt team. See more of her writings here.